Here are 10 interesting fun facts about Thanksgiving. Thanksgiving is one of my favorite holidays. I love getting together with loved ones to make new memories, and I love stuffing myself with all the yummy food. Aside from the turkey, pumpkin pie, and football, have you ever wondered about the origins and traditions of Thanksgiving Day? Here is a list of 10 interesting fun facts about Thanksgiving that will give you more insight about the origins and traditions of the holiday. Although there are several claims as to where the first Thanksgiving took place, the traditional story that we associate with Thanksgiving is the three day pilgrim celebration that took place in 1621 at Plymouth Colony, in present day Massachusetts. This is regarded as the first American Thanksgiving. Over 200 years later President Abraham Lincoln issued a Thanksgiving Proclamation declaring the last Thursday in November as a national day of thanksgiving. It wasn’t until 1941 that Congress made Thanksgiving an official national holiday. Every year since 1947, the National Thanksgiving Turkey Presentation is a ceremony that takes place at the White House a few days before Thanksgiving. During the ceremony the President of the United States is presented with one live turkey, and two fully-dressed turkeys. The president does not eat the live turkey, instead he “pardons” the bird and spares it from being slaughtered. After being pardoned, the turkey then gets to live out its days on a farm. The tradition of the annual Macy’s Thanksgiving Day Parade began in 1924 in New York City. The parade was originally known as Macy’s Christmas Parade to help commence the beginning of the Christmas shopping season. Macy’s Thanksgiving Day Parade was launched by Macy’s employees, and featured animals from the Central Park zoo. There were also not as many balloons in the parade then as there are now. Today it is estimated that about 3 million people attend the parade in New York City, and that about 44 million people watch the parade on TV from the comfort of their home. I have watched this parade almost every year of my life. It’s a tradition that I look forward to every year. Thanksgiving Day is the busiest travel day of the year. The American Automobile Association (AAA) has estimated that over 42 million Americans travel by car 50 miles or more over the holiday weekend. Another 4 million people fly the skies to visit their loved ones for the holiday. The first Thanksgiving feast in 1621 was not too different than our own traditional Thanksgiving dinner. Their feast consisted of turkey, venison, waterfowl, lobster, fish, clams, pumpkin, squash, berries, and fruit. Aside from the seafood, most of the foods that were eaten on that first Thanksgiving have become staples of our present-day Thanksgiving feast. According to the National Turkey Federation, over 95% of Americans eat turkey on Thanksgiving. Around 280 million turkeys are sold for Thanksgiving feasts. There Is no official reason as to why turkey is the food of choice for Thanksgiving meals. Turkeys were the most plentiful meat at the time of the first Thanksgiving in 1621, and ever since then we’ve carried on the tradition of eating turkey for Thanksgiving. Cranberries are one of only three fruits that are native to North America. Native Americans were the first to reap the many benefits of cranberries. Aside from eating cranberries, Native Americans used the red juice from cranberries a dye for clothing, rugs, and blankets. They also used cranberries as a medicine to treat ailments, and to treat arrow wounds. Native Americans believed in the medicinal use of cranberries long before scientists discovered their health benefits. Nowadays, cranberries are an essential side dish to our Thanksgiving feast. In 2001, the U.S. 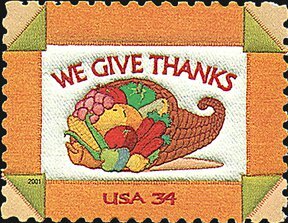 Postal Service issued a commemorative stamp in honor of Thanksgiving. The stamp was designed by artist Margaret Cusack, and it was made to resemble traditional folk-art needlework. The stamp was created to commemorate the tradition of being thankful for the abundance of goods we enjoy in America. The wishbone of the turkey is used in a good luck tradition on Thanksgiving. The tradition consists of two people tugging on either end of the bone trying to win the larger piece. Whoever wins the larger piece gets to make a wish. This tradition dates back to the Etruscans of 322 B.C. The Romans brought the tradition with them when they conquered England, and the English colonists then proceeded to carry the tradition to America. In the United States, football is a major part of the Thanksgiving celebration. Dating back to the first college football game between Yale and Princeton that was held on Thanksgiving Day in 1876, football games have since become synonymous with Thanksgiving ever since. It’s interesting to think that one football game played in 1876 would have such an impact and create a tradition that would be carried on for years to come. "Call the Mortgage Masters & Consider It Closed!" We Are Tough Loan Experts! Copyright © 2019 Mortgage Masters Group All rights reserved.